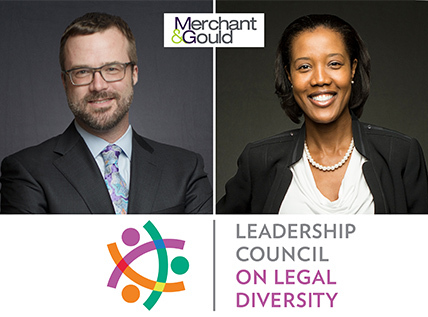 Merchant & Gould is pleased to announce that attorneys John T. Winemiller, Ph.D., and Loretta L. Freeman have been selected as members of the Leadership Council on Legal Diversity (LCLD) 2018 Class of Fellows and Pathfinders, respectively. Winemiller is the Managing Partner of Merchant & Gould’s Knoxville office. His practice centers on patent, trademark, trade secret, and copyright litigation, as well as IP licensing issues and trademark, patent, and copyright counseling and prosecution. He has represented clients in a broad range of industries, from electrical switches and electronic pet products, to hosiery manufacturers and home builders. An active participant and leader in his community, Winemiller is Chairman of the Board of Commissioners for Knoxville’s Community Development Corporation, Knoxville’s public housing and redevelopment authority. He also serves on the boards of directors for the Knoxville Symphony Orchestra, the Knoxville Jazz Orchestra, and Positively Living, an organization serving persons living with HIV/AIDS. He chairs Merchant & Gould’s Diversity Committee. As a Fellow of the LCLD, Winemiller will participate in a landmark program created by the organization to identify, train, and advance the next generation of leaders in the legal profession. Loretta Freeman, an Associate in Merchant & Gould’s Minneapolis office, will be part of the Pathfinder program, designed by the LCLD to train early-career attorneys in critical career development strategies, including leadership and the building of professional networks. A former 3M engineer for eleven years, Freeman brings her extensive experience in product development and commercialization to her intellectual property practice, specifically in the in the electro-mechanical and mechanical fields. She has written and prosecuted many patent applications in the U.S. and abroad, and she has experience advising clients on patentability, validity, freedom-to-operate, and infringement issues. Freeman also has experience in trademark clearance, registration, and enforcement. Freeman was a Super Lawyers Rising Star in Minnesota in 2017, and she has been listed in The National Black Lawyers Top 100 Lawyers and Top 40 under 40 since 2015. A frequent volunteer, Freeman serves as a pro bono attorney for the Volunteer Lawyer's Network in housing court for low-income clients in need of legal advice. She also volunteers with the LegalCORPS Inventor Assistance Program, assisting inventors in obtaining patents. Freeman is admitted to practice in Minnesota and is pending admittance in Georgia, where she will soon be transferring to the firm’s Atlanta office. She is registered to practice before the U.S. Patent and Trademark Office. Merchant & Gould is proud to be an LCLD Member Firm. Founded in 2009, LCLD is a growing organization of more than 285 corporate chief legal officers and law firm managing partners who are personally committed to creating a more diverse and inclusive legal profession. The LCLD Fellows program, which has trained more than a thousand mid-career attorneys since 2011, is one of LCLD’s most important initiatives. The LCLD Pathfinder Program is now in its third year as a full-scale program, having been piloted in 2015 among a select number of LCLD Member law firms and corporations. It is an initiative that has filled a gap in LCLD programming, targeting junior associates and the youngest members of corporate law departments. For information, visit www.lcldnet.org.